Add a clean, timeless look to your bathroom space with the Sheffield 80-inch Double Bathroom Vanity. Distinctive styling and elegant lines come together to include a cultured marble vanity top with a 3-inch backsplash for a luxurious look. A beautiful complement to any decor, from traditional to minimalist modern, this vanity unit boasts five deep-doweled drawers with fully-extended under-mount soft-close drawer slides and four functional doors to accommodate your storage needs. Metal exterior hardware with a brushed chrome finish offers a beautiful overall accent with a polished shine. Sheffield 80-inch Double Vanity in White with Marble Vanity Top in Carrara White Add a clean, timeless look to your bathroom space with the Sheffield 80-inch Double Bathroom Vanity. Distinctive styling and elegant lines come together to include a cultured marble vanity top with a 3-inch backsplash for a luxurious look. A beautiful complement to any decor, from traditional to minimalist modern, this vanity unit boasts five deep-doweled drawers with fully-extended under-mount soft-close drawer slides and four functional doors to accommodate your storage needs. Metal exterior hardware with a brushed chrome finish offers a beautiful overall accent with a polished shine. 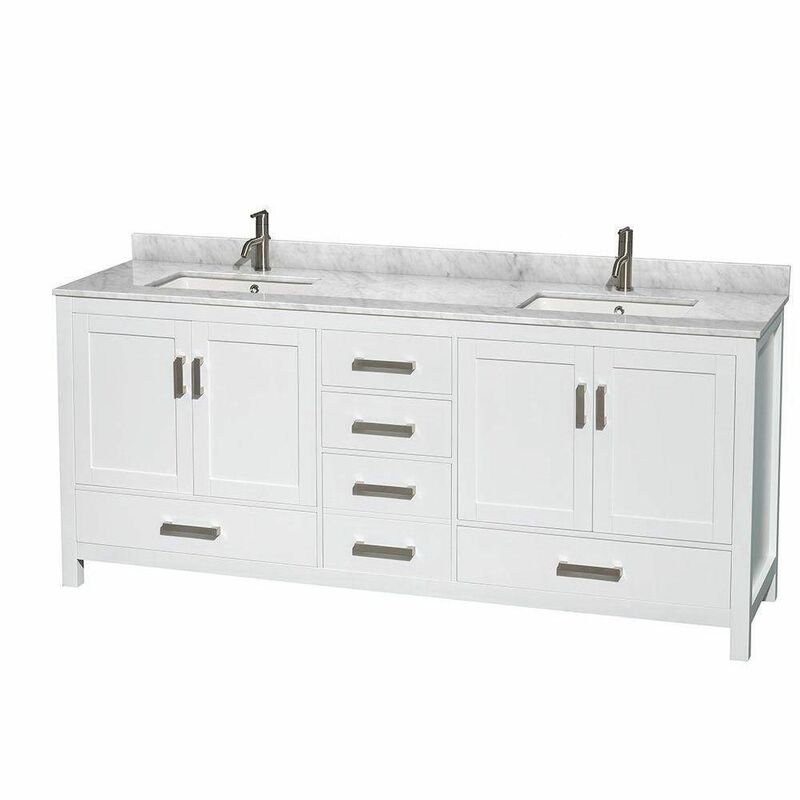 Sheffield 80-inch Double Vanity in White with Marble Vanity Top in Carrara White is rated 4.3 out of 5 by 34. Rated 5 out of 5 by Humberto from Very pleased with this vanity, overall a well-built, well-designed piece.... Very pleased with this vanity, overall a well-built, well-designed piece. A couple of negatives. The backsplash included with the vanity is 3 inches high. I ordered the side splash separately but they only come 4 inches high. It doesn't make sense, why would Home Depot do this? They should work with vendors to have this corrected. Where's Home Depot QC?Other negative, they delivered 1 day early, which is good, but they came like thieves, in the middle of the night and placed the 2 huge crated boxes right in front of the garage door. I was not given notice so when I went to leave the house the next morning, I couldn't. Can you imagine having an emergency and not being able to do anything because somebody thought it'd a good idea to block driveway? Rated 3 out of 5 by Lehaz from Collection is very nice but we had 3 deliveries starting... Collection is very nice but we had 3 deliveries starting from September through November. First delivery had damaged cabinets. Second had broken backsplash and the third delivery was lost for a week. I would reccomend homedepot to have it delivered directly. Rated 5 out of 5 by Tech4fun from Excellent construction. Received in perfect condition the first day in the date range it was prom... Excellent construction. Received in perfect condition the first day in the date range it was promised. Love it. Lots of storage space. We thought it had only four legs which might have not been enough for the 80 inches length but fortunately had 2 extra legs in the middle that you don't see in the pictures. Rated 4 out of 5 by danielramseur from So far we are very pleased with this vanity and have been using it over 1 week now. Shipping was ... So far we are very pleased with this vanity and have been using it over 1 week now. Shipping was faster than expected, delivery was great (called day prior and then an hour before and brought into garage with other items we were collecting for contractors to use in master bath reno) and packaging was perfect - we didn't use the backsplash though so I never actually saw it but vanity, countertop and sinks were all in perfect condition. It has a lot of storage, drawers pull smoothly (after a couple days break-in period) but I did replace the hardware as we had a wall cabinet built to match and needed to coordinate handles. FYI it is very very bright white. Both the Delta Trinsic and Compel faucets look great and resemble manufacturers photos, we chose Trinsic for a minor cost savings. Only minor knocks are that the original hardware felt a little hollow/cheap and that the carrara marble is very easily scratched but I'm going to seal soon so that should help. The basic shaker style can be adapted to many different decorating styles. Overall, a great value and I'm very glad we bought it! What a huge cost savings over custom cabinets, countertop and sinks! Rated 5 out of 5 by Heather from This vanity worked great. It was solidly built and easy... This vanity worked great. It was solidly built and easy to install. Rated 4 out of 5 by JeffnSD from Overall I like this vanity. It is not 80", the cabinet is about 79" and the top just over 79½". ... Overall I like this vanity. It is not 80", the cabinet is about 79" and the top just over 79½". As a lot of people indicated was their experience in the reviews, the backsplash piece came broken, although I hadn't planned on using it because there wasn't enough room between the counter top and the mirror that was already there. I did have issues with the delivery company sending out only one person the first time to deliver it, but I think that depends on your region and they did come back with a second person. What sized sink does this accommodate? I would like to change the hardware handles. Could you tell me the size of handles for the drawer and cabinet? Thank-you! Hi Sylvie, We would highly suggest to wait for the delivery of your vanity, take handle to match hole pattern for best results. When it arrives Is the vanity and the vanity top attached or separate? Looking to purchase but have to consider how to get it up a flight of stairs and around 3 tight corners. The Sheffield unit counter top is separate from the cabinet. The cabinet would be in one box and the counter is a separate wooden crate.